At the risk of repeating myself, my work was selected by jury to be included in another show! This one is a preview exhibition for San Francisco Open Studios, which takes place in October (when I’ll be exhibiting with other night photographers again at Fort Mason Center). For this preview show, only 10 artists were chosen out of the 35 who submitted work. I’ll have two new, large prints there, of Eternal and Large Boat Winch. Canvas Gallery is a very popular spot, and it’ll be a good place to expose my work to a new audience. Canvas Gallery is in the Sunset neighborhood of San Francisco, at 1200 Ninth Ave. (at Lincoln), across from Golden Gate Park. My work will be on display until August 20. A reception will be held on Friday night, July 28, 8 p.m.–2 a.m. at Canvas, which also has a cafe and lounge. A French DJ will be playing world lounge music. It’s a fun place to hang out, so I hope you’ll join me. 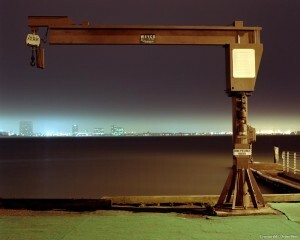 Large Boat Winch was selected by a jury to be included in this year’s New Visions exhibition at Pro Arts. I’m excited to have been included in the show, which is an annual exhibition of work from among Pro Arts’ members. Only 30 pieces were chosen from among several hundred entries. The show runs through September 6. The jurors were Dennis O’Leary, executive director of the Djerassi Resident Artists Program, and Gary Sangster, executive director of the Headlands Center for the Arts. A reception will be held on Thursday evening, July 20, 6–8 p.m. at Pro Arts. Come on out and mingle!